These beef taquitos are super easy to make, and perfect as an appetizer or dinner. 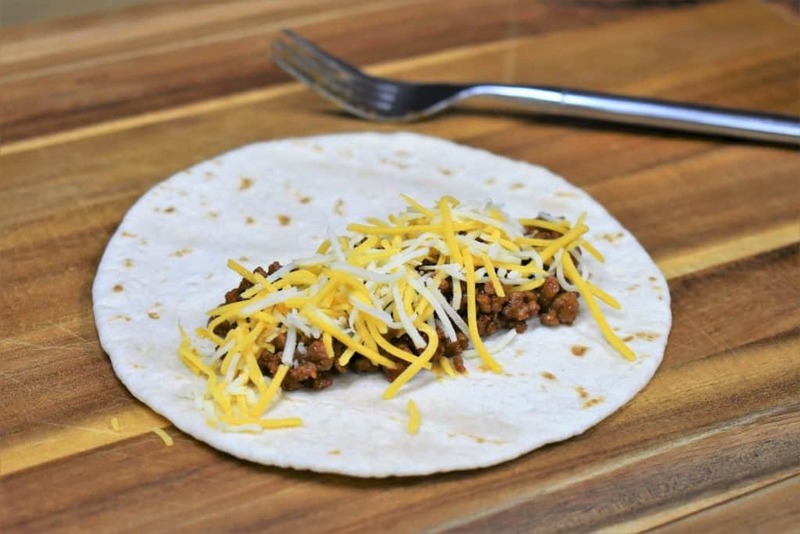 Lean ground beef is seasoned with a southwestern inspired spice blend and cooked with tomato sauce to make a flavorful and delicious taco filling. 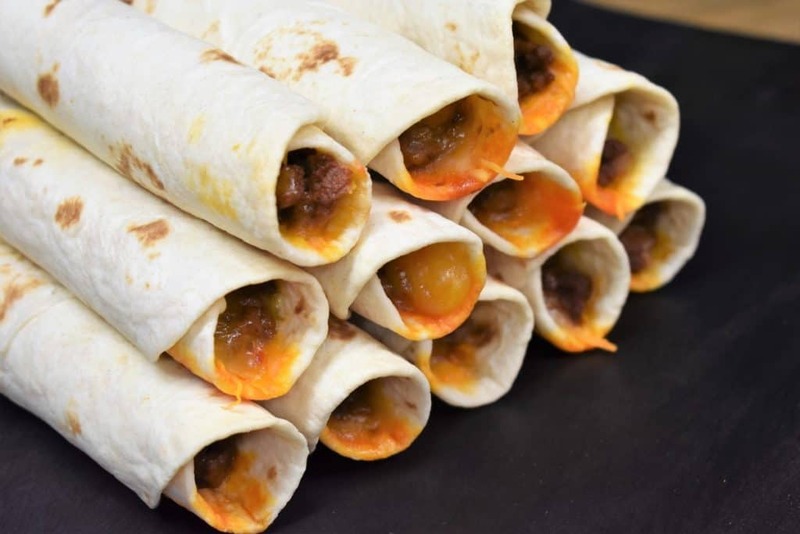 We add shredded cheddar jack cheese and use flour tortillas to roll the taquitos. Then we bake them until they’re hot and crispy. Serve these taquitos with a spicy crema and fresh salsa and watch them disappear. If you’re in the mood for more party food, check out these chicken nuggets with a sriracha ranch dipping sauce. These grilled chicken wings that are marinated in a flavorful mojo for a delicious tropical flavor, or try this simple hot spinach dip for a really quick appetizer. Need a great cocktail for your party? Try this delicious homemade margarita. These taquitos get their flavor from a homemade taco seasoning mix. We use just a few simple ingredients that are available in the spice aisle of any supermarket. Make a spicy crema by combining sour cream with your favorite hot sauce. A quick way to make a delicious dipping sauce! This is our version of salsa fresca or pico de gallo. Our fresh salsa is a simple combination of tomatoes, onions, lime juice and cilantro. It’s a delicious with tortilla chips, and goes great with these taquitos. 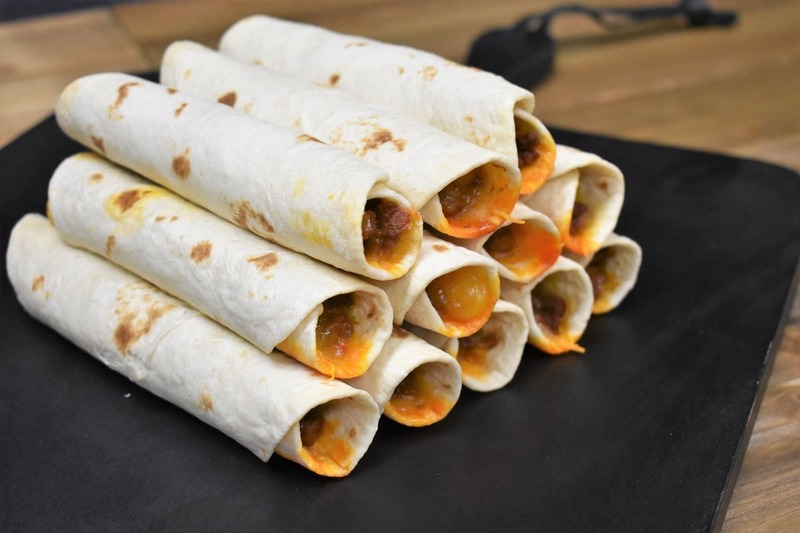 Serve an assortment of hot sauce varieties with these beef taquitos and let you guests choose. Add the chili powder, salt, garlic powder, onion powder, cumin and black pepper to a small bowl, stir to combine. Heat the canola oil in a large skillet over medium high heat. When the oil is hot, add the ground beef. Sprinkle the top with the prepared seasoning mix. Start to stir and fold the ground beef to incorporate the seasoning mix. 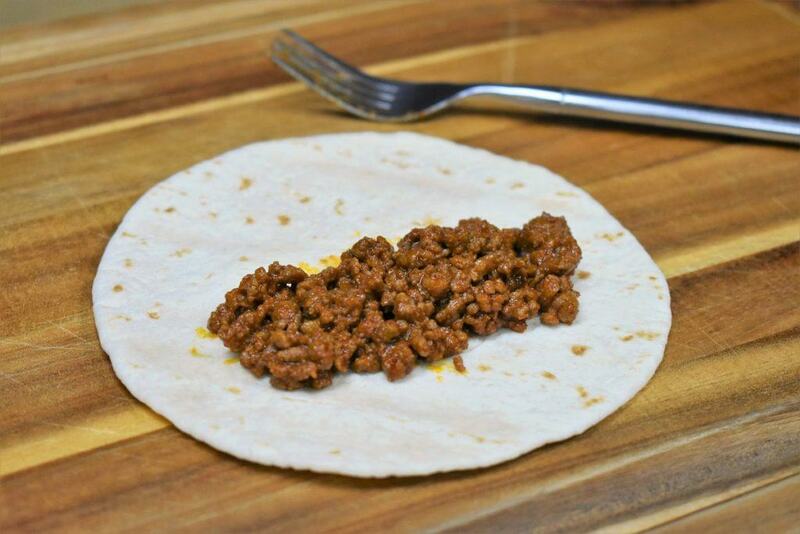 Cook the ground beef until browned. This will take approximately 4-5 minutes. Stir and break up any large pieces of meat with a wooden spoon or spatula. Now that you’ve browned the ground beef, add the tomato sauce and water to the skillet. I like to add the tomato sauce first, then add the water to the empty can and give it a swirl. That way I get every last drop out. Stir the beef and sauce well. Lower the heat to medium-low and cover the skillet. Cook the ground beef for 20 minutes until cooked through, stirring occasionally. We also want most of the liquid to cook out. The meat cannot be too wet to make the taquitos. If you have too much liquid, uncover the skillet. It will dry out quickly. Take the skillet off the heat and let it cool. Give the ground beef a stir every once in a while to let the steam escape. It will cool quicker. 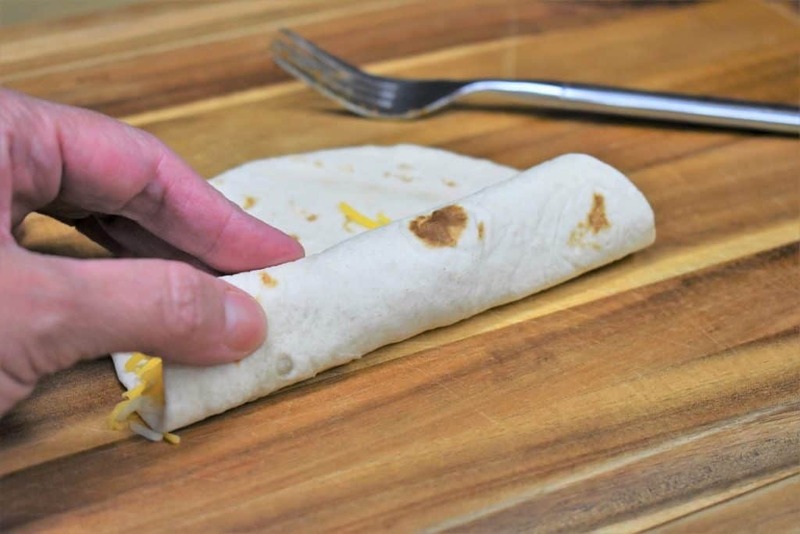 Place a tortilla wrap on a flat surface. Add 1 heaping tablespoon of the ground beef a little off center towards the side closest to you. Arrange the beef filling in a line so that it’s not mounded. Add a generous pinch of the cheddar jack cheese over the ground beef. Roll the tortilla tightly, away from you, and place it seam side down on a baking sheet that’s lined with parchment paper. 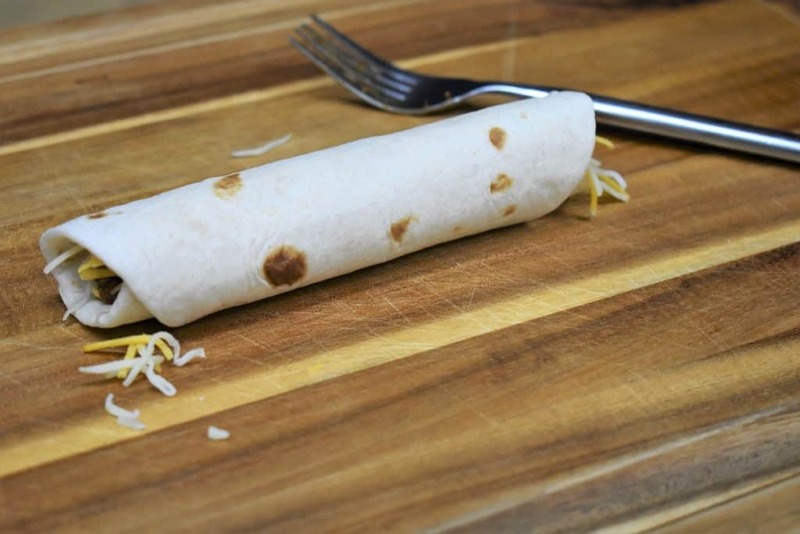 Some liquid may come out of the taquito during the rolling process, keep a paper towel handy. 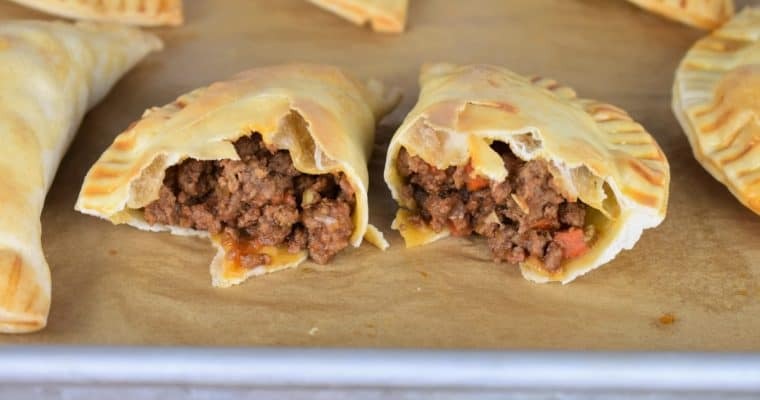 Repeat until all of the ground beef filling is used up. Bake the taquitos for about 20-25 minutes until the tortillas are nice and crispy on the outside. Keep an eye on the taquitos, check them after 15 minutes or so, just in case. You should get 18-20 delicious beef taquitos. 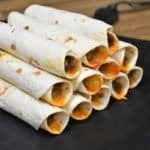 And, if you like these taquitos, try these chicken taquitos that are just as delicious, these shredded chicken tacos, or these beef & bean burritos for easy weeknight dinner inspiration. These beef taquitos are great as an appetizer or dinner. 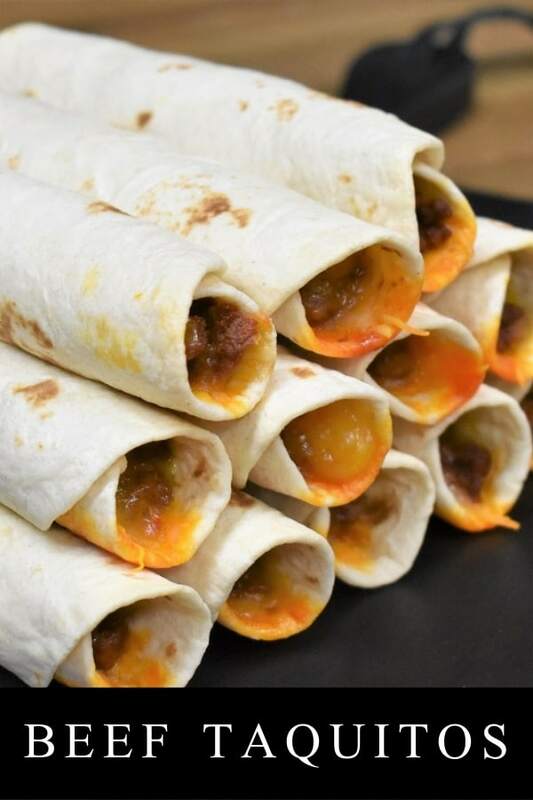 They’re rolled in flour tortilla, filled with flavorful beef and cheddar jack cheese and baked until hot and crispy. Heat the canola oil in a large skillet over medium high heat. When the oil is hot, add the ground beef and sprinkle the top with the prepared seasoning mix. Start to stir and fold the ground beef to incorporate the seasoning mix. Cook the beef until browned. This will take approximately 4-5 minutes. Stir and break up any large pieces of meat with a wooden spoon or spatula. Add the tomato sauce and water to the skillet. Let most of the liquid to cook out. The meat cannot be too wet to make the taquitos. If you have too much liquid, uncover the skillet. It will dry out quickly. Roll the tortilla tightly, away from you and place it seam side down on a baking sheet that’s lined with parchment paper. 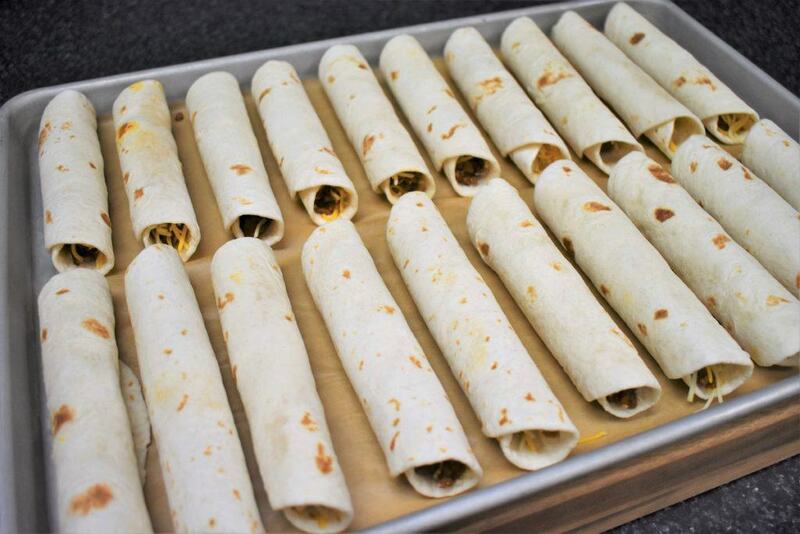 Bake the taquitos for about 20-25 minutes until the tortillas are toasty on the outside. Check them after 15 minutes and gauge from there.